I love a big, fresh salad with dinner! 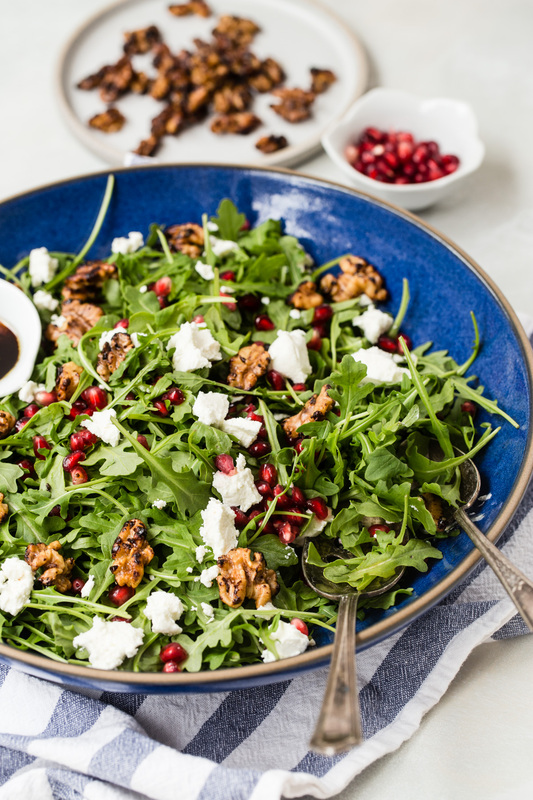 This winter farmer's market salad is a refreshing and crisp accompaniment to any meal. There's a vendor at our farmer's market who sells every type of nut imaginable, and when I saw they had candied walnuts I immediately purchased a bag for snacking. 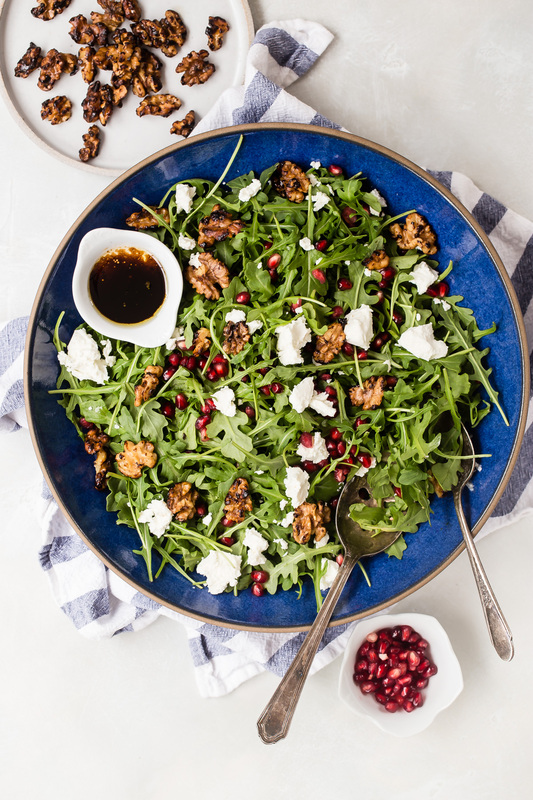 The sweetness and crunch from the walnuts balances out the tart pomegranate seeds, and tangy goat cheese. You can serve this salad with your favorite salad dressing, but I love a nice balsamic vinaigrette with this one. 1. Place all ingredients in a large salad bowl and toss to combine. 2. Drizzle with your favorite salad dressing. Balsamic vinaigrette is perfect for this salad. I've gotten back with my ex boyfriend with the help of Dr.Great the best spell caster online and i highly recommends Dr.Great to anyone in need of help!.. I want to testify of how i got back my boyfriend after he breakup with me, we have been together for 3 years, recently i found out my boyfriend was having an affair with another Girl, when i confronted him, it led to quarrels and he finally broke up with me, i tried all i could to get him back but all to no avail until i saw a post in a relationship forum about a spell caster who helps people get back their lost love through Love spell, at first i doubted it but decided to give it a try, when i contacted this spell caster via his email, and he told me what to do and i did it, Then he did a Love spell for me. 28 hours later, my boyfriend really called me and told me that he miss me so much, So Amazing!! So that was how he came back that same day, with lots of love and joy, and he apologized for his mistake, and for the pain he caused me. Then from that day, our relationship was now stronger than how it were before, All thanks to DR.GREAT. he is so powerful and i decided to share my story on the Internet that Dr.Great real and powerful spell caster who i will always pray to live long to help his children in the time of trouble, if you are here and you need your Ex back or your husband moved to another woman, do not cry anymore, contact this powerful spell caster now. Here’s his contact: Email him at: [email protected] or [email protected], you can also call him or add him on WhatsApp: +2348118829899 you can also visit my blog at http://donnakelvin150.over-blog.com, THANKS TO DR.GREAT..
Dr Omomoh spells worked immediatly.Thanks for helping me win the lottery for $25,000,i also won an intant ticket 7 days days later for $1,400. I know i was impatient and worried,But Dr Omomoh you kept me calm and were very kind and very helpful.I want everyone how you helped me and my family,thank you Dr Omomoh.It has only been 7 days since your lucky casting and i have already won. I hit the pick 4 straight and won $6,000,i know more winnings are coming. Thank you Dr Omomoh.Whatsapp/call +2347037314837 Email [email protected] good luck. Whats App him via +14173235434, He is a very honest spell caster and 100% reliable. Regards and Good Luck. today is really a great day in my life coz I have overcome and solve my relationship problem with my boyfriend! I have been through some bad times with my boyfriend coz he broke up with me because of another girl he met at the store, he left the house and never cares about our son I did everything possible tryna talk sense into him but he won’t even listen to anyone! My friend Alison introduce me to Dr.Abaka a spell caster in Africa and he prepared a spiritual love spell on him that he was under enchantment from the girl..My boyfriend came back two days later apologizing and I just sat down speechless ?? I couldn’t say anything coz I was surprised at how he has change with the help of Dr.Abaka and now we are leaving together with peace and love which is what I have always wanted, I believe there are others going through relationship problems, break ups and divorce but am urging you to contact Abaka today on Email [email protected]/ https//:drabakaspelltemple.blogspot.com or chat him on WhatsApp +2349063230051 coz that's what I did. I'm so excited my broken Marriage has been restored my ex husband is back after he left me and our 2kids for another woman. i was so happy to talk to Dr. Benson how he help many people to bring there Lover back so i contact him to help me too. that was how Dr. Benson help me to bring my husband back.. A big thank to you Dr. Benson because I never thought my ex Husband will be back to me so quickly with your spell. You are the best and world greatest. if you are here and you need your Ex Lover back or your husband moved to another woman, do not cry anymore, contact this powerful spell caster now. Here’s his contact: Email him at: [email protected] or what's-app +2349023727004. his email again is [email protected] or Facebook at priest.babaka thank you. I've gotten back with my ex boyfriend with the help of Dr.Great the best spell caster online and i highly recommends Dr.Great to anyone in need of help!.. I want to testify of how i got back my boyfriend after he breakup with me, we have been together for 3 years, recently i found out my boyfriend was having an affair with another Girl, when i confronted him, it led to quarrels and he finally broke up with me, i tried all i could to get him back but all to no avail until i saw a post in a relationship forum about a spell caster who helps people get back their lost love through Love spell, at first i doubted it but decided to give it a try, when i contacted this spell caster via his email, and he told me what to do and i did it, Then he did a Love spell for me. 28 hours later, my boyfriend really called me and told me that he miss me so much, So Amazing!! So that was how he came back that same day, with lots of love and joy, and he apologized for his mistake, and for the pain he caused me. Then from that day, our relationship was now stronger than how it were before, All thanks to DR.GREAT. he is so powerful and i decided to share my story on the Internet that Dr.Great real and powerful spell caster who i will always pray to live long to help his children in the time of trouble, if you are here and you need your Ex back or your husband moved to another woman, do not cry anymore, contact this powerful spell caster now. Here’s his contact: Email him at: infini[email protected] or [email protected], you can also call him or add him on WhatsApp: +2348118829899 you can also visit my blog at http://donnakelvin150.over-blog.com, THANKS TO DR.GREAT..
WOOOOOOOOOW!I am so happy to shear the goodness of Priest Aziba ,my name is Eric Rodgrigaz a local estate agent now living on the house of my own choice.When I first brought Spell from Email: [email protected] , to win my lotto that was 2018, He showed me how to arrange my winning numbers to win big amount of money . A week later, I my Gfriend went back and matched the spell Lotto numbers to the EuroMillions draw all five numbers matched and i won £81,674.50,I was crazy because I did not put the numbers on the ticket to play but just to try the numbers Priest Aziba gave to me. So, it shows you that this system works. I play all the time now and i always win with the spell of Priest Aziba magic winning numbers. Email at [email protected] And also Write ti his active WhatsApp on +2348100368288 he is really magical telling and giving you all the numbers to play with. I dont have much to say but try his help and be happy like me ERIC forever. With a grateful hearth , I want to give my sincere appreciation to Dr Sambo He is the best , he’s so wonderful and helping. I will forever be grateful for your kind gesture. Contact him today through his email he can help you. HE CAN DO ANY KIND OF SPELL YOU MAY WANT. 1 GETTING YOUR EX LOVER BACK.